This entry was posted on October 23, 2009 at 1:49 pm and is filed under Roof cleaning. You can subscribe via RSS 2.0 feed to this post's comments. wow! that quantity of moss reminds me of visits to see my aunt in california. 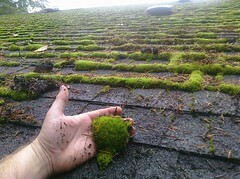 have you ever thought of installing a plastic roof like davinci to avoid this moss growth? check it out at davinciroofscapes.com. Thanks for sharing that link. Thats a beautiful product! Wish I could get those for my place.